Following my previous post about revisiting locations, I’d like to talk about replicating other’s photos. I often struggle with recognizing the great shot until I’m back home looking at my results. I can see where I should have used a different focal length, shot from a different angle, changed the exposure, etc. We’re all challenged to force the shot we see with our eyes into the tunnel vision of the viewfinder. Somewhere in between are the great shots. Time and practice will tell, but for now I look to others for inspiration and sometimes replication. Maybe you’ve found yourself doing this; a few days before a family vacation I’ll scour photography sites. I currently use the iOS app MapPhotos. It’s not beautiful, but lets me navigate a map and search against Flickr, Panoramio, etc. I find a few shots that I want to capture, and make some mental notes: time of day, weather, perspective, etc. In the field, usually before sunrise, I fumble around trying to replicate these guesses. Sometimes it works but I’m often thwarted by a “No Public Access” sign, or I’m not wearing the right clothing to venture off the path. In some situations the difference is out of my control, like storm clouds for a dramatic sky. 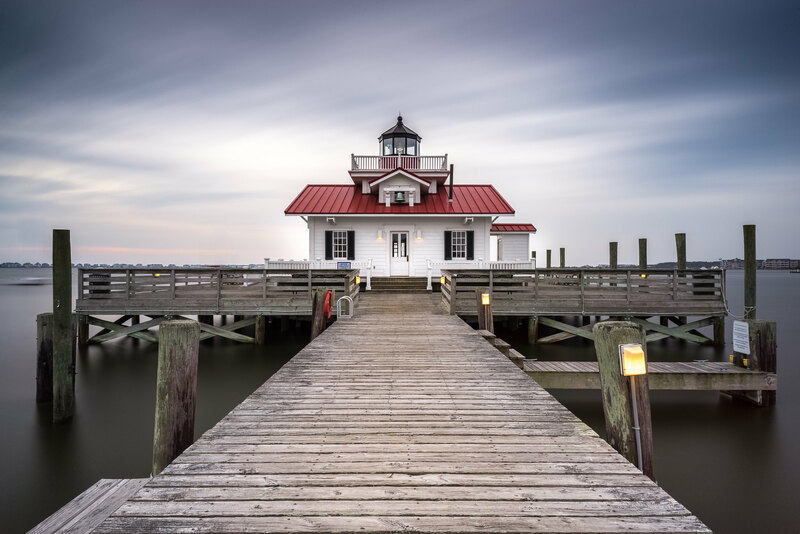 The shots in this post are of the Manteo Island Lighthouse on the coast of North Carolina. I’ve visited this site a few times, but never thought of shooting it until I saw this amazing shot by David Allen. While vacationing in OBX I made a pre-dawn trip to the lighthouse. The composition was straight forward, and I even had a good mix of clouds in the sky. Everything looked right but I mixed up one big factor: David’s shot was at sunset (the front of the lighthouse faces west). If you compare his shot with mine you get a warmer, more natural feel. It feels older, slightly troubled. His clouds are turbulent, more so because he used the right amount of long exposure to give them some motion. 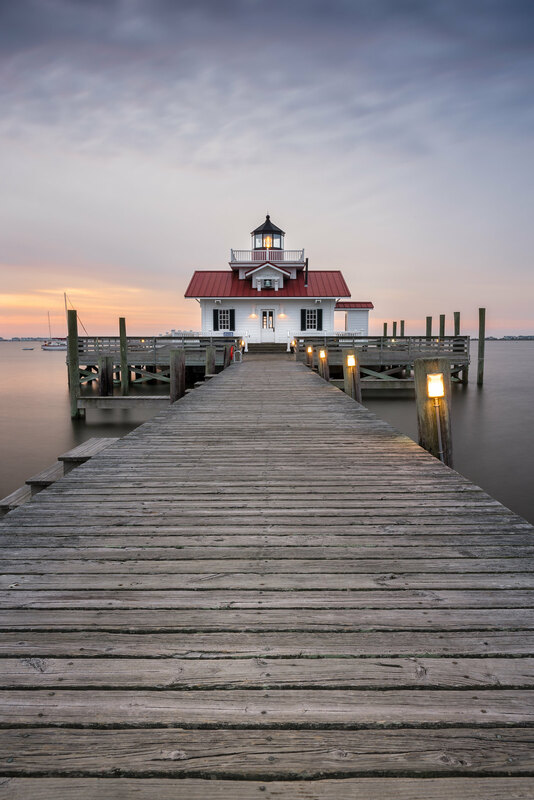 He also chose a wider focal length, which really stretches out the pier. All calculated decisions. I was discouraged by what should have been obvious differences, and then I realized that this is all a bit of luck and lots of practice. Not taking anything away from David’s skills, but I’m sure he visited this site many times. He probably took tons of shots that he didn’t consider keepers. I imagine he was frustrated at times, and then all of the hard work paid off. On some random outing the sun, moon, stars and clouds all lined up to give him the shot he was looking for. Either that or the guy’s just that good, but my guess is we share similar struggles. I stepped away for a week and when I came back I processed my shots the way I caught them, with the conditions that were provided. I went for a relaxing morning feel: calmer skies, muted tonal range, and a good amount of manual edits to clean up the lighthouse. The next time I vacation here I’m sure I’ll get different conditions with which I can produce a different mood, but I need to remember to work with what I’m given and just keep coming back. Here is an identical setup, but in the portrait orientation. Comparing the two, I prefer the landscape version. 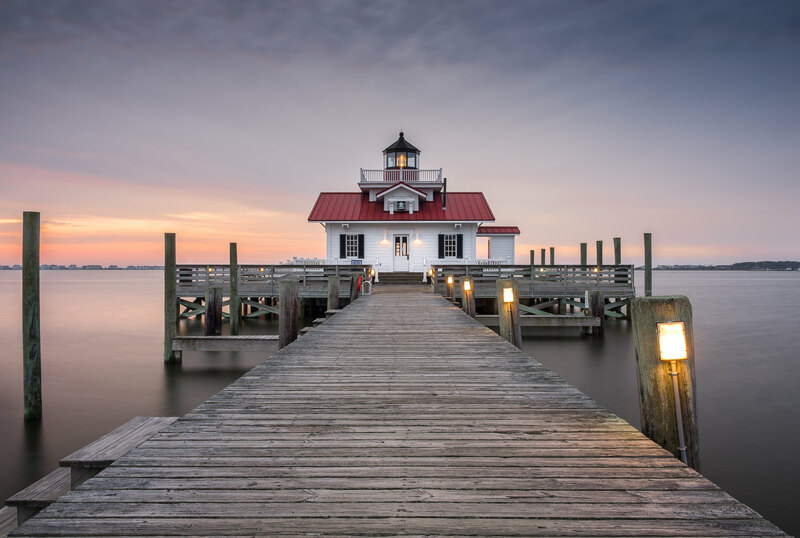 The portrait puts too much weight on the pier and the sky, while the landscape version strikes a nice balance. Still, I’m a sucker for portrait landscapes. What outing would be complete without a long-exposure? The clouds and water came out great; the calm surface contrasting with the turbulent cloud movement. A break in the clouds behind the lighthouse makes for a natural vignette. Now if I just had the patience to take these images into photoshop I could remove that blurred boat on the left. The purist in me says “don’t do it”, but the critical voice is starting to win out.